What are the most popular online bachelor's degrees offered in Maryland? Maryland is among the 15 member states of the Southern Regional Education Board (SREB), an interstate compact for education. This allows access to a host of benefits related to online and distance learning, namely, the SREB Distance Learning Policy Lab. The Policy Lab focuses on increasing access to and lowering the cost of online higher education across the South and beyond. Students from SREB's member states also have access to Electronic Campus, where they can choose to enroll in numerous programs and courses offered outside their state of residence. Maryland itself has also prioritized online higher education through the development of MarylandOnline (MOL), a consortium of colleges and universities in the state that provides students with cutting-edge e-learning resources and more online courses and programs to choose from. Uniquely, membership in MOL is open to both public and private institutions, giving students that utilize MOL more online learning options than can be found in many other states. Many of the best online colleges in Maryland provide top educations comparable to their traditional counterparts. For students who need to balance pursuing degrees with job and family commitments, Maryland's host of online higher education options makes earning a degree possible. Continuing Education courses for working adults pursuing continued learning are also offered online. Though GWU is based in Washington, D.C., its proximity to Maryland means that it serves many of the state’s residents, earning it’s spot among the top online colleges in Maryland. The school’s online degrees encompass most major academic disciplines, including the liberal arts, education, business, and medicine. GWU offers degrees of all levels, from associate to doctoral, along with several certificate programs. Courses often use both synchronous components, such as live video lectures or class sessions, and asynchronous components, such as independent assignments and readings. Online learners have access to comprehensive support services, including academic advising, library resources, disability support, technical support, career counseling, and peer tutoring. GWU offers two tutoring services for online students: STEMworks, which provides students with tutoring in most academic subjects (even those outside the STEM field), and the University Writing Center, which aids with writing assignments of all types at all levels. Serving more than 20,000 students, TU is one of the largest and most respected online schools in Maryland. The college offers one fully online degree program: a bachelor of science in allied health. This degree completion program is intended for applicants who already possess an associate degree in allied health; TU's program allows online learners to complete all upper-division credits with no required on-campus courses. The school also hosts several off-campus degree programs, offered at education centers and community colleges around the state. The off-campus offerings include several popular degree options, such as nursing, psychology, elementary education, and business management. Many of these degrees use the 2+2 model, which allows students to complete the first two years of a bachelor’s degree at a community college before transferring to TU to complete their remaining credits. These programs often include a significant online component, adding to their flexibility and cutting down on necessary campus visits. Based in Washington, D.C., Gallaudet is a college intended for deaf and hard of hearing students, with most of its online degrees related to deaf studies, counseling, and education. Undergraduate students can pursue an online bachelor’s degree in either deaf studies or psychology. Both degrees are completion programs intended for applicants who have already earned at least 80 undergraduate credits, either from Gallaudet or another accredited two- or four-year college. The school’s master’s degrees include a fully online program in education, along with hybrid programs in clinical mental health counseling, sign language education, and summer and online school counseling. The three hybrid degrees require different levels of commitment to on-campus courses. The clinical mental health counseling program, for example, requires students to complete the first year of courses on campus before performing a fieldwork placement experience and online courses during the second year. The sign language and school counseling degrees offer predominately online courses mixed with campus residency sessions in the summer. Part of the University System of Maryland, which includes the flagship University of Maryland College Park campus, UMUC is one of the largest online learning schools on the globe. With nearly 90,000 students worldwide, the school offers bachelor’s, master’s, and doctoral degrees in dozens of disciplines online with the backing of the power university system. UMUC online students can earn bachelor’s degrees in biotechnology, business administration, cybersecurity, legal studies, marketing, and nursing, among other majors. Aside from being one of the largest online colleges in Maryland, UMUC is also the most accessible, with special programs to help veterans and military families, transfer students with credits from multiple schools, and in-state students with full-time jobs. Online students seeking professional or academic degrees will both appreciate UMUC’s eResources, such as free electronic textbooks, library resources, and interactive exercises. UMUC has a 65-year track record of providing quality education around the globe. One of the top technical online schools in Maryland, Capitol offers undergraduate degree completion programs in business administration, cyber and information technology management, and cyber and information security. Intended for applicants who have completed their first two years of undergraduate credits, these degrees allow transfer students to complete the final two years of their degree online. Applicants may earn lower division credits through on-campus courses at Capitol or through another accredited two- or four-year school. Graduate students choose from a wide selection of fully online master’s degrees, including computer science, cyber analytics, electrical engineering, or a unique, highly innovative program in unmanned and autonomous systems. Graduate courses use a mixture of synchronous and asynchronous coursework, with independent assignments throughout the week and live class meetings held on weekends. Capitol also offers four doctorate programs available primarily online: business analytics and decision sciences, cybersecurity, technology, and a combination MS/Ph.D in technology. These programs deliver most courses online with some weekend campus residencies required. FSU in Frostburg, Maryland started providing online classes in 2003. Since then, the state school has become one of the best Maryland online colleges and offers hundreds of classes and six degree programs. State residents can earn an undergraduate degree in nursing completely online or study for graduate degrees in business, parks management, nursing, computer science, and special education with online or hybrid classes. In addition to the six available degree programs, there are plenty of credit-bearing options for students both in-state and out during the fall, summer, spring, and winter intersession. One of the most popular online options for FSU students is the Summer Online Freshman Initiative, which allows incoming freshmen to earn some general education credits early through online courses in foundational areas of study. FSU’s online education mission is to provide technical skills and teaching strategies that help students meet academic or career goals, while providing a flexible and available accelerated learning environment. Students have access to a number of student resources which focus specifically on faculty interaction. The University of Baltimore is located in the Mt. Vernon neighborhood, but Maryland residents can take classes anywhere in the state via the school’s online classes. Consistently rated one of the best online colleges in Maryland, University of Baltimore allows residents to earn a bachelor in business administration (BBA) or master’s degrees in business, public administration, or interaction design, all with in-state tuition. Students have the choice of hybrid degree programs, with a mixture of on-campus courses and online classes, or can learn fully online. Taught through the online course management system Sakai, UB online courses include the same faculty and peer interaction students have on the Baltimore campus. UB’s online programs are designed for convenience and distance learning. Students can continue their education anywhere with an Internet connection regardless of how busy their schedule is. Online students have access to many of the students services available on campus, including advising. UB has been a member of the University of Maryland system since 1988 and nearly 40,000 alumni live in the state. A private college based in Baltimore County, Stevenson is among the top online colleges in Maryland, serving around 1,500 distance education students annually. The school’s career-focused online programs include business administration, business communication, criminal justice, legal studies, nursing, and interdisciplinary studies, which is a customizable program that allows students to combine two of the preceding subject areas into a versatile degree. Most programs use primarily asynchronous courses, offered in accelerated eight-week blocks. Stevenson pairs all online learners with a student success coach, who offers academic advising and counseling. Success coaches help students select courses, plan their degrees, and connect to other school resources. Current students and graduates also benefit from career services, which can help them identify and achieve personal and professional goals. Along with resume and interview training, online learners receive access to Stevenson Career Connections, an online job posting system that identifies career opportunities. Founded by the U.S. Catholic Bishops, CUA ranks as one of the top online schools in Maryland. The school is based in nearby Washington, D.C.’s Brookland neighborhood, which is home to dozens of Catholic educational institutions. CUA focuses on the needs of working students, with practical coursework that stresses professional skills and offers several opportunities for degree candidates to graduate at an accelerated pace. Students with relevant experience can take advantage of the school’s Prior Learning Assessment program, which awards academic credit for approved professional learning experiences. Previous job experience, professional or military training, and even certain life experiences may qualify for credit, and academic advisors can help students determine if their experiences meet CUA’s criteria. The school also offers accelerated bachelor’s to master’s pathways for candidates interested in graduate education. These 2+1 programs allow students to apply some undergraduate credits toward their master’s degree, and thus complete both programs faster. A Catholic institution located in Baltimore, NDMU is another of the best online colleges in Maryland. The school offers online degrees at the bachelor’s, master’s, and doctorate level. Undergraduates can pursue bachelor’s programs in business or liberal arts, available in either a four-year format or a two-year completion format for those who have already fulfilled lower division credits. Registered nurses can complete an online RN-BSN pathway that also takes two years to complete. At the graduate level, NDMU offers three programs: contemporary communication, gifted and talented education, and analytics. Finally, at the doctorate level, the school offers a Ph.D in higher education leadership for changing populations, a unique program available fully online with no campus residency requirements. All of NDMU’s online programs offer rolling admissions with multiple start dates throughout the year, making it convenient for working students to begin a degree when it fits their schedule. Online education has made obtaining a degree more accessible to individuals unable to attend classes on campus. As this learning method grew in popularity, online classes began to be seen as reliable tool for campus-based courses as well. Known as hybrid learning, this teaching style involves students splitting their time between campus and online attendance. Hybrid courses offer students the benefits of in-person and digital learning, while minimizing the drawbacks suffered from using just one of these methods. As online learning becomes mainstream, it is likely you will encounter it in some form or another during your higher education career. It's important to learn the basics of what's involved in a digital classroom so you can choose the best learning method for you. Be sure to look into to the different options above to find a school whose digital learning environment fits your personality. 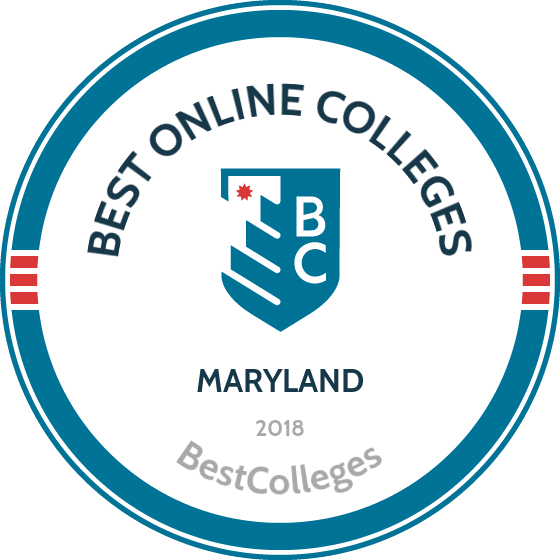 Browse our list of the best online colleges in Maryland for more insight into distance learning programs in this state. A recent NCES reports indicated that 37.7% (119,779) of undergraduate students enrolled in Maryland's Title IV institutions were in exclusively online programs. Employment growth in this profession is strong in Maryland. According to the Maryland Department of Labor, Licensing & Regulation, long term projections show an increase of 20% in the total number of jobs between 2014 and 2024. Wages increased by 8% from 2011-2016. In 2016, what were the top careers in Maryland for people who had a degree in business administration and management? Data source: Maryland Department of Labor, Licensing & Regulation, Bureau of Labor Statistics. Data may not be available for every year. Employment growth in this profession is strong in Maryland. According to the Maryland Department of Labor, Licensing & Regulation, long term projections show an increase of 47% in the total number of jobs between 2014 and 2024. Wages increased by 27% from 2011-2016. In 2016, what were the top careers in Maryland for people who had a degree in computer and information systems security/information assurance? Employment growth in this profession is strong in Maryland. According to the Maryland Department of Labor, Licensing & Regulation, long term projections show an increase of 108% in the total number of jobs between 2014 and 2024. Wages increased by 5% from 2011-2016. In 2016, what were the top careers in Maryland for people who had a degree in registered nursing? Employment growth in this profession is strong in Maryland. According to the Maryland Department of Labor, Licensing & Regulation, long term projections show an increase of 50% in the total number of jobs between 2014 and 2024. Wages increased by 15% from 2011-2016. In 2016, what were the top careers in Maryland for people who had a degree in information science/studies? Employment growth in this profession is strong in Maryland. According to the Maryland Department of Labor, Licensing & Regulation, long term projections show an increase of 61% in the total number of jobs between 2014 and 2024. Wages increased by 13% from 2011-2016. In 2016, what were the top careers in Maryland for people who had a degree in computer systems networking and telecommunications?